Ravensbrück concentration camp was unusual in that it was built solely for women. During World War II over 130,000 female prisoners passed through the camp. Around 40,000 were Polish, 26,000 were Jewish, 18,800 were Russian, 8,000 were French, and 1,000 were Dutch. About 50,000 women died from disease and starvation, over 2,000 were killed in the gas chambers and only 15,000 survived to be freed at the end of the war. One such woman was the remarkable Dutch woman, Corrie ten Boom. Corrie grew up in Haarlem, the youngest of four children. Her father was a watchmaker and under his tutelage became the first licensed female watchmaker in the Netherlands. She also ran a church for mentally-disabled people and was a foster-parent, amongst other charitable works. Early in the war Corrie was visited by a Jewish woman who, as a result of the German occupation of Holland, was scared to return to her own home. She had heard that the Ten Booms had helped their Jewish neighbours and asked Corrie for help. Corrie agreed and, together with her sister Betsie, opened their home to Jews and members of the Dutch resistance who were trying to evade the Gestapo and other German authorities. Their home became known as “The Hiding Place”, later becoming the title of the book Corrie wrote about this time in their lives. So many people sought refuge in the house that the family built a secret room in Corrie’s bedroom in case the house was raided. Being on the top floor gave people the most time to hide and avoid detection, as searches usually started on the lower floors and worked towards the top of the building. The space could hold up to six people, all of whom had to stand very quiet and very still. Some seeking refuge would stay for just a few hours, while others would stay for several days until another safe house could be found. 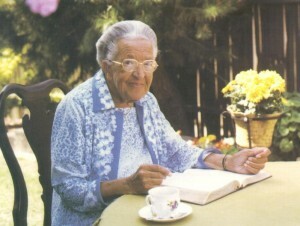 Corrie ten Boom became a leader in the group which controlled a network of safe houses across Holland. Through these activities the lives of somew 800 Jews were saved. In February 1944 a Dutch informant told the Nazis about the Hiding Place and they arrested the entire family. They were all sent to Scheveningen prison, where her father, then aged 84, died. Corrie and Betsie were sent from there to Herzogenbusch concentration camp and finally to the Ravensbrück, where Betsie died. Thanks to what Corrie later remarked was a clerical error, she was released just 12 days after the death of her sister. When the war ended Corrie returned home to The Netherlands to set up a rehabilitation center for concentration-camp survivors. In the spirit of the Christianity she practiced, she also took in those who had collaborated with the Germans during the occupation. In 1946 she returned to Germany and later travelled the world, visiting over 60 countries as a public speaker. She wrote many books, the most famous, The Hiding Place, was made into a film in 1975, with Jeannette Clift playing Corrie and Julie Harris her sister Betsie. Towards the end of her life Corrie settled in the USA and died there aged 91. Corries life, and the extraordinary courage of her family, is celebrated in The Ten Boom Museum, Haarlem. Her life is recalled here as a celebration of her courage and humanity and as a tribute to all of the women who survived and those who perished.